(October 5, 2018) – In Accordance with Article IV Section 4.5 of the Charter of the City of Sunny Isles Beach, it is my honor and privilege to submit the Proposed Budget for fiscal year 2018 -2019. The filing of the 2018-2019 Fiscal Year Budget represents my thirteenth Budget as your City Manager. Our assessed value has stayed relatively the same as last year, and we have continued to craft a budget that reduced the millage rate to 2.2 mils per $1,000 of assessed value. This has resulted in an unprecedented 2nd year that our City has proposed a tax rate below the roll back rate. Future anticipated revenue from growth of our tax base will need to be directed to the Capital Fund expenditures for transportation and pedestrian safety initiatives, storm drainage, facilities and new park development projects. This year our Police Department celebrated it’s 20th Anniversary, and with it came the retirement of Chief Maas, and a new era with the promotion of Captain Snyder, becoming the third Police Chief in the history of our City. Ongoing projects include the finishing touches to Gateway Park and the build out of the interior space at Gateway Park for the Seniors Program and other activities, including a banquet facility that will be available for local rental. The Florida Department of Transportation has completed the paving of Collins Avenue, which has now allowed the City to continue with its utility undergrounding project. The next phase of the project will be the installation of the decorative streetlights throughout Collins Avenue. Simultaneously, we hope to have the Florida Power & Light authorized electrical contractors commence the underground wiring of the new system. Our pending agenda of projects are still many. The City Government Center and School Expansion remains on hold while the City Commission has given the School Board additional time to continue the Address Verification Program that was entered into on January 9, 2017. The process of weeding out students fraudulently enrolled in our School has been slow. The first full year of results shows a reduction of about 4%. The construction of the Pedestrian/Emergency Bridge from 174th Street to 172nd Street was completed and opened early this calendar year, to a great reception by Residents and all pedestrians. We are currently working to obtain the necessary easement to commence planning and design of the pedestrian bridge over Collins Avenue at 174th Street to Samson Oceanfront Park. We are also in the design phase for the bridge over Collins Avenue at the Government Center. We have been awarded a $500,000 federal grant through the State Transportation Alternatives Program (TAP) for this bridge. We have commenced work on the Central Island Drainage Project. This project includes the cleaning and restoring of our deep Stormwater wells along N. Bay Rd. between 174th St. and 183rd St. The project scope may be expanded based on the initial findings during the first phase of this improvement project. We received $300,000 through our State Representatives for this project. We are staffed to almost 95% in service delivery areas. In order to better serve our residents and continue the goal of being a World Class City, we have restored the positions of Assistant City Manager, and City Engineer which will enhance our ability to expedite capital projects and continue to improve our maintenance operations, while saving money on outside consulting services. As stated , the Budget provides for a reduction of the property tax rate, resulting in a millage rate of 2.2 mils per $1,000 of assessed value. This is achievable even with only a 1.84% increase in our taxable value of all property within the City. It is important to note that this includes $169 million of property value increase and over $31 million of new construction added to the tax rolls in our City this year. Our City’s assessed property tax value will continue to increase over the next five to seven fiscal years as the new construction continues on a steady but somewhat slower pace than the previous few years. The City Commission decided on this tax rate reduction partially because we were able to reduce operating budget requests, while maintaining sufficient funding to continue to improve our service delivery and continue our capital project funding for another year. There are currently twelve development projects approved, with eight of them under construction. There were also two projects completed which added 291 residential units in the City. All these projects contribute to our increased revenue from such sources as ii. Building Department fees, bonus payments, funds from Transferrable Development Rights (TOR), impact fees, and ultimately property tax revenue. The proposed General Fund budget expenditures (not including transfers out to other funds) increased to $35,628,839, which represents an increase of $405,671, or 1.2%, from fiscalyear2017-2018. Expenditures have increased primarily due to: (1) the addition of 4.75 FTE positions and increased costs for medical benefits and retirement system contributions ($432,586), (2) additional departmental needs including election expenses ($168,700), increased debt service due to higher principal payments ($51,756) offset by (3) a capital outlay reduction ($247,371). Communications Services Tax revenues continue to decline due to legislative changes and decreased collections. The revenues from this source are estimated to be approximately $105,000 less than fiscal year 2017-2018. In the intergovernmental revenue category, state revenue sharing is projected to increase $28,048 and local government half-cent sales tax projections are projected to increase $32,197 over 2017 -2018. Charges for Services are projected to increase $372,625 over 2017-2018. This is primarily due to increased cultural and recreational program collections and increased parking collections. One-time capital outlay expenditures for 2018-2019 are $920,243 (vs. $1,167,614 in 2017- 2018), a decrease of $247,371. Major revenue sources in the Street Maintenance and Construction Fund include intergovernmental revenues such as State Revenue Sharing, Transportation Surtax, and Local Option Gas Tax. This is the sixth year of this fund, which was developed for the benefit of segregating the uses of this revenue source. This fund accounts for the costs related to street construction and maintenance programs. The total budget is $ 3,566,452. Major revenue sources in the Building Fund include fees generated from building permits and inspections. This fund was developed for the benefit of segregating the uses of this revenue source. This fund accounts for the costs related to the administration and enforcement of the Building Code. Revenue, not including appropriated fund balance, is $2,612,500, a decrease of $8,300 from the prior year. This fund was created in 2014-2015 for the benefit of segregating the use of public art trust fund revenues to purchase and maintain art within the City. The total budget is $633,181i an increase of $348,632 from the prior year. With the establishment of an active Public Arts Advisory Committee and its work to create a public art plan under the parameters that shall have been jointly established with the Commission, this Fund becomes an important asset. Its funds will now be directed in accordance with a more formalized vision for quality public art in the City. The City has a Stormwater Operating Fund and a Stormwater Capital Projects Fund. The Stormwater Operating Fund is primarily self-supporting and has budgeted revenues of $991,000, similar to the prior year. This fund incurs costs to ensure compliance with the National Pollutant Discharge Elimination System Permit. Stormwater Capital Projects are funded by the Local Option Gas Tax and transfers in from the Stormwater Operating Fund as available. Accumulated fund balance (carryover) will be utilized for drainage projects in the city during fiscal year 2018-2019. The Capital Improvement Program concentrates on the development of parks, infrastructure, and rehabilitation of our facilities including major road resurfacing, infrastructure upgrades, and expansion. A capital improvement project generally exceeds $25,000 and has a useful life of five years or more. The City has been successful in leveraging City dollars to obtain grant awards and legislative appropriations for some capital projects and will continue to seek these where possible. The City has one Capital Projects Fund: The General Capital Improvement Program Fund, which is funded by a transfer from the General Fund, grants, impact fees, other development fees and contributions/donations. The capital projects, which total $19,229,021 (including $12,429,021 carryover from the 2017-2018 fiscal year) are recommended and funded by the General Capital Improvement Program Fund. The significant projects include $5 million for the interior build out of Gateway Park, $2.5 million to rebuild the Golden Shores Stormwater pump station, and $1.2 million added to the utility undergrounding project. There are remaining many other projects related to facilities, infrastructure, and parks. All of the Capital Improvement Projects requested and proposed for this year are fully detailed in our proposed Five-Year Capital Improvement Plan (CIP) located in the CIP section of this document. Please note that many capital projects are multi-year endeavors. The 2018-19 Fiscal Year Budget is a financial plan that will continue to provide a full scope of high-quality municipal services. Our programs, special events, and public safety enhance life in our City. This Budget also provides the required resources for us to complete all the great parks, facilities, infrastructure, and other amenities that make our community so desirable. A special word of thanks to our Mayor and Commissioners for their tremendous support and direction throughout the year. I am grateful for our dedicated Department Heads and staff who work hard, and particularly our Finance Department, under the new leadership of Tiffany Neely. The City continues to operate with a clear plan of maintaining fiscal strength and stability. 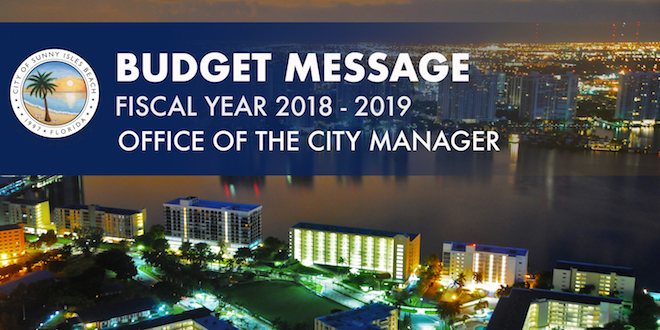 This Budget will enable the City of Sunny Isles Beach to continue its quality of life as a thriving and safe community that cherishes its location, unites in its diversity and evolves to meet the continuous challenges that greet us every day. View the Adopted Budget 2018-2019 and other financial reports.